The Kampa Hi-Lo Pro Medium Table offers alight weight aluminium frame allowing you and your family to enjoy your food in the great outdoors. This Kampa Hi-Lo Table comes with adjustable legs allowing the table to be levelled on uneven ground and also has adjustable height so you and your family can eat in comfort and enjoy every moment in the great outdoors. 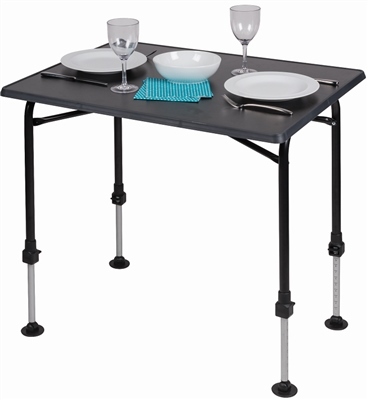 This Kampa Hi Low Table is superb for camping, caravanning, going for a picnics or when you just need some extra table space in the garden. This table is amazing, all four legs are adjustable no matter what the ground is like the table will always be level.